Hotel Lakeside is more than 130 years old. President Rutherford B. Hayes stayed at the Hotel for reunions of his old Civil War regiment, the 23rd Ohio Volunteer Infantry. 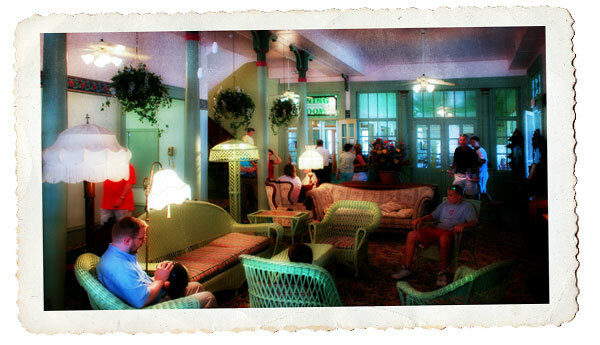 The hotel still retains much of its Victorian charm both inside and out. Besides the lobby and dining room, the screened front porch is a popular gathering place to spend a summer morning over a cup of coffee and reading a favorite newspaper, or enjoying the view. When staying there, you can almost image big-hatted Victorian ladies strolling through the lobby. The hotel was built in 1875 and enlarged in 1879 and again in 1890. The hotel has 76 guest rooms. There is also a large screened porch where you can relax watching the lake or some of the many activities. The lobby is furnished with a variety of antiques and period furniture and green wicker chairs, large ceiling fans and stained glass windows. The guest rooms offer a variety of antiques with period wallpapers and additional furnishings. All of the rooms feature high ceilings. Above: Rutherford B. Hayes at the Hotel Lakeside in 1883 during a reunion of the 23rd OVI. Hayes is seated just left of center with white shirt and flowered lapel. Located in the lake front park just east of the hotel are two artillery pieces appearing to be guarding Lakeside from attack from Lake Erie. 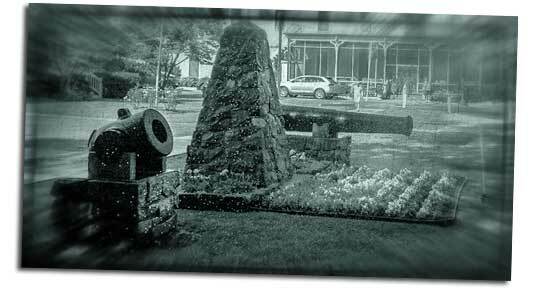 These artillery pieces were purchased by Rev. C.W. Tanneyhill, Lakeside Director from 1887 - 1804. He purchased the Civil War mortar and cannon from Fort Myers, Virginia in the late 1800s. While the hotel is great for a weekend visit, most people rent one of the individually owned cottages for the week. Cottages and houses run the gamut in size, style and furnishings. Rentals are arranged through one of the real estate companies located in the village or occasionally through individual owners. The Fountain Inn does not have the charm of the Lakeside Hotel, but it does have the charm of a 1970s hotel. Located in the heart of the Lakeside Community Business District and just 1 block from Lake Erie. The hotel has 47 rooms and is frequently completely booked up, so plan ahead if you would like to spend the night.